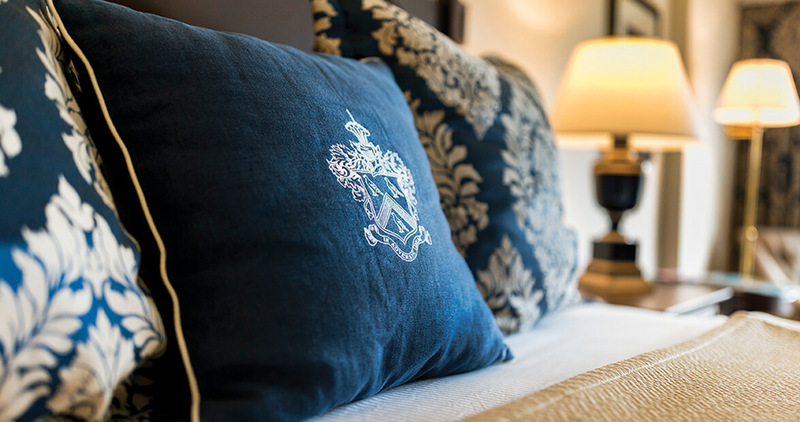 Relax in maximum luxury at the Washington Duke Inn in Durham. Arriving at Durham’s Washington Duke Inn & Golf Club feels like the end of a fairy tale, or maybe a game of “Dungeons & Dragons”: If you make it safely through the (Duke) forest, you are greeted at the castle’s entrance by a pair of alabaster lions, friendly ones. They wear wreaths around their necks; a small child is climbing on the back of one of them. Smiling valets usher you inside, where you will enjoy meat and grog. There is even a princess in this tale — “a member of the royal family of a Middle Eastern country,” according to Building a Heritage, a coffee table book, published in 2013 to commemorate the Washington Duke’s 25th anniversary. “The princess came into the restaurant and the staff could tell she didn’t feel well,” says the book, which is in every guest room of the inn and for sale in the gift shop. The staff offered her all varieties of delicacies, but she insisted upon a simple grilled cheese sandwich from the children’s menu, which restored her to health and happiness. A skeptic might note some euphemisms and contradictions here: royalty vs. humility, tycoon vs. philanthropist, mansion vs. home. On the other hand, a skeptic might be pleasantly disarmed by a stay at the inn. Why am I so fond of this tradition-steeped Southern hotel? I’m a Jewish girl from Chicago, I don’t golf, nobody in my family went to Duke. I’ve never visited England, never attended a traditional English afternoon tea. I am clearly not qualified to appreciate the Washington Duke’s English country-house decor, and anyway, as a creative writer, I should prefer postmodern boutique hotels, where the avant-garde art installations are indistinguishable from the furniture. What can I say? Some of us don’t want to live on the set of Mad Men. The Washington Duke is an easy three-hour drive up I-40 from my home in Wilmington, the weather fair and lovely. But because I stayed up all the night before on the phone with a new long-distance boyfriend, I’m frazzled and starving when I arrive midafternoon. I order a room-service cheeseburger even before I unpack, before I text the boyfriend to let him know of my safe arrival. The burger is delivered by a beaming, preternaturally courteous young man who looks like he might still be in high school. He asks if he can remove the enormous silver plate cover for me. “No, I think I can handle it,” I say, then realize how sarcastic I sound and try to compensate by over-thanking him. “Can I open your ketchup for you?” he asks. Together, we look at the single-use bottle of Heinz. “Oh, no thanks!” I say, sounding hysterically grateful. My cell phone starts buzzing and I hurriedly sign the check. “You know,” I say conversationally, or possibly with malevolence, “I don’t even like ketchup.” Panicked by my own rudeness, I immediately offer him a bunch of red grapes from my plate. He gives me a shocked, oh-I-couldn’t-possibly look, but I insist that he take the grapes, which he finally does, after making me pinky-swear that I won’t tell anyone. We actually do this — lock pinkies. Exit cherubic waiter. My cell phone is fixing to explode. Long-distance boyfriend is appalled that I ordered room service before calling him. He is not amused by the weird exchange about the ketchup. I don’t even mention the pinky-swearing. Between texting him various reassurances, I manage a bite of the fragrant, velvety, Cheddar-drenched burger, but then my room phone rings. Hold on, I tell the boyfriend. Somewhere in Chicago, the boyfriend detonates in a fit of rage. Our relationship self-destructs shortly thereafter. Moral: Jealousy and sleep deprivation are no match for the power of Southern hospitality and a cheeseburger. A man I dated in college once told me I smelled like “an expensive hotel.” It was Chanel No. 19, actually, but I took the compliment. If the Washington Duke Inn had a signature perfume, its top note would come from the enormous urn of lilies and gladioli in the lobby, the potted orchid on the concierge’s desk, and the single-cut rose on each room-service tray, with heart notes of English tea, strawberries, chocolate, fresh eggs, and applewood-smoked bacon, all layered over the woody, grassy, green base notes of the golf course and surrounding acres of forest. Tobacco should be in there, too, of course, but the hotel is non-smoking these days. Thank You For Not Smoking signs are placed, discreetly, everywhere. Though the Washington Duke was built in 1988, it feels so thoroughly historic that the date of construction hardly seems to matter. 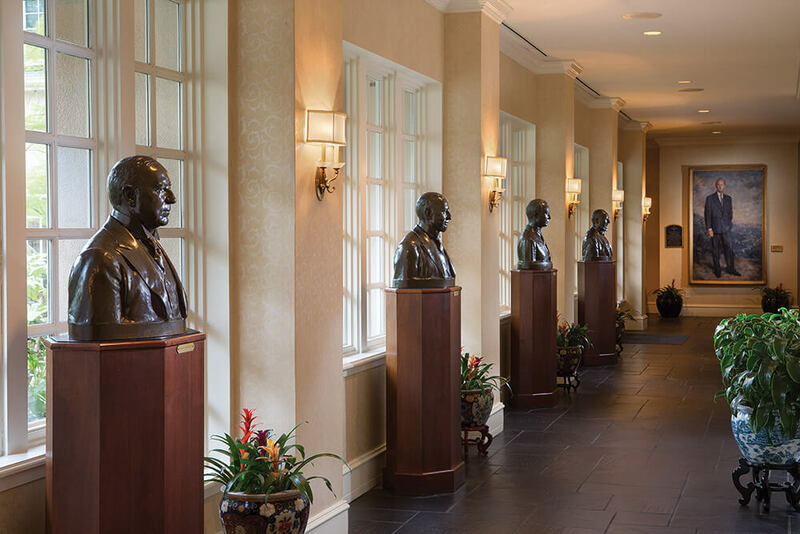 Maybe it’s the European-style tea served five afternoons a week in the AAA Four Diamond Award-winning Fairview Dining Room, or the bronze busts of famous Southern men lining a corridor off the lobby. Or the museum-like display in another hallway, framed medals and keys to various cities and photos of Kennedys, kings, and other dignitaries, all honoring the career of Angier Biddle Duke, Washington Duke’s great-grandson, who served as U.S. ambassador to El Salvador, Spain, Morocco, and Denmark in the mid-20th century. Somehow, though, these rituals and displays don’t feel ostentatious or intimidating. In fact, you can stay at the hotel for days without ever noticing them. As if to underscore the relative importance of everything, across the hall from the Angier Biddle Duke wall is the gift shop, where you can buy deodorant and People magazine and coloring books, Duke bathrobes and T-shirts, teddy bears wearing Duke bathrobes and T-shirts, cheap candy, expensive candy, and adorable, realistic-looking stuffed lemurs. You can visit real lemurs at the Duke Lemur Center, to which the Washington Duke Inn regularly donates linens and tailor-made bedding. If it bothers you that these creatures are sleeping on sheets with a higher thread-count than yours, try to remember that you’re not an endangered species. On the second day of my stay, some Triangle-based friends meet me for lunch in the hotel’s Bull Durham Bar; we clink glasses in honor of one friend’s birthday. I suppose it’s possible that our waiter, whose name tag says Angel, overhears us, though nobody in our party told him outright — I’ve noticed a stealth element to the hotel’s famously superb service. At the end of our meal, a beautifully plated slice of chocolate torte arrives, gratis, complete with lit candle, requiring us to sing, which we do with energy — maybe because all of us are so happily surprised. 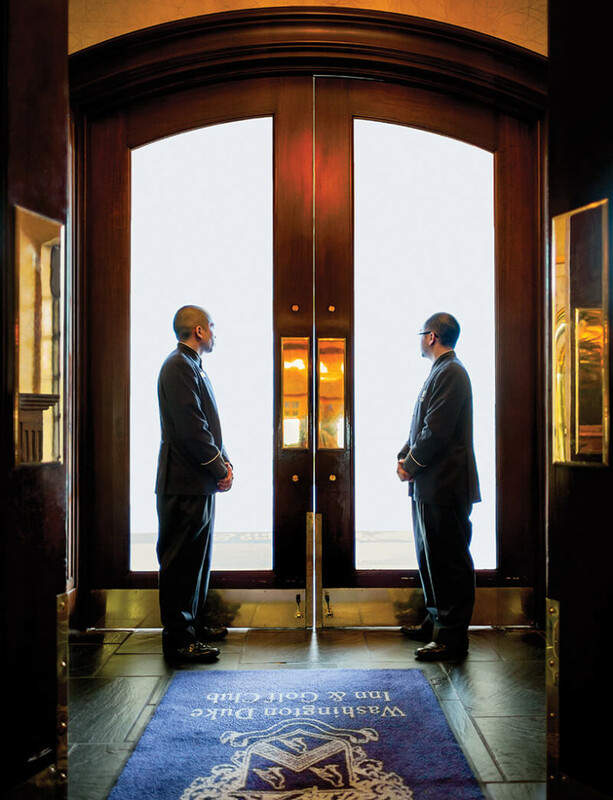 According to Building a Heritage, Washington Duke employees follow the “10/20 Rule,” which dictates that when they come within 20 feet of a guest, they must smile; within 10 feet, they must greet the guest (by name, if possible). This rule strikes me as a kind of reverse restraining order. I wonder what happens at five feet, at one foot — but maybe that’s a pinky-sworn secret. At the gift shop, I ask the guy behind the counter about strange or impossible requests. He tells me that a guest once asked for Rogaine — which was weird because the guest had a full head of hair, and also, Rogaine takes weeks to work. Also, he adds, this just happened an hour ago. I look around, confused, but don’t see any bald or not-bald men. Another odd request, the guy continues, was for tickets to a Duke vs. Virginia Tech basketball game, only the game had already happened. The gift shop guy is clearly messing with me. Is it the hotel’s intention to make guests forget time exists? But then he says the man was just an avid collector, the desired tickets were obtained from Duke’s box office, and everyone lived happily ever after, outside of the constraints of time. Tonight, the soft voices lull me, reminding me of my connection to everyone else in the world. The first time I stayed at the Washington Duke was a few weeks after 9/11; I was in Durham to promote my recently published book, but, like many people, I felt my voice had vanished. Words and books seemed beside the point. Nobody was going to bookstores or anywhere else yet, and my event was sparsely attended. Back at the inn that night, I climbed into my perfectly turned-down bed and watched “Larry King Live” on TV with the sound off. The guests included Queen Noor of Jordan, and a blind man with his guide dog, a golden Lab. A caption said that the man had made it down safely from the 78th floor of the World Trade Center. The guide dog sat calmly at the blind man’s side. But when the man spoke, the dog’s face grew animated, and he became, somehow, completely involved with the man. At one point, the man appeared to start crying — he gestured in an agitated way — and the dog reached out its paw and put it on the man’s hand. I watched this moment from my silent cocoon; it felt like the beginning of healing. On my last evening at the inn, the weather is so perfectly temperate that I leave my window open, fresh air and quiet laughter wafting up from the terrace below. Usually, noise of any kind keeps me awake, but tonight, the soft voices lull me, reminding me of my connection to everyone else in the world. I fall asleep thinking about the infinite definitions of “luxury,” and how any hotel that claims to offer it would have to accept and adapt, infinitely, to every possible kind of guest in every possible situation or state of mind, a mission that seems imbued less with entitlement and tradition than with generosity of spirit and simple human grace.